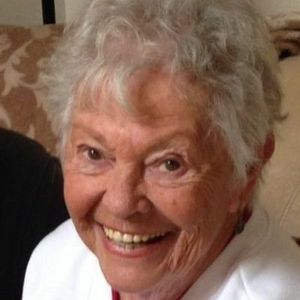 DUGAN, AGNES SMITH, 84, of Cape May Court House, NJ, passed away on Saturday, October 13, 2018. Born to the late Thomas and Jane Leslie Fullerton, she grew up in Moorestown, NJ. She started raising her family in Maple Shade, NJ before moving to Cape May County forty years ago. Agnes was a member of Our Lady of the Angels Church. She enjoyed the beach, traveling and late night card games. Her greatest love was her family, especially the time spent with her grandchildren and great grandchildren. Agnes is survived by her husband of 65 years, James J. Dugan; her children, Eileen Roussos (James), Bob Dugan (Kim), James Dugan (Susan), Colleen McHugh (Brian), Michael Dugan (Theresa), Joan Gallagher (Gerard), and Kathleen Katheder (James); her seventeen grandchildren; her sixteen great grandchildren and many nieces and nephews. Viewings will be held on Wednesday, October 17, 2018 at the Radzieta Funeral Home, 9 Hand Avenue, Cape May Court House, NJ from 6:00 p.m. to 8:00 p.m. and on Thursday, October 18 at Our Lady of the Angels Church, 35 East Mechanic Street, Cape May Court House, NJ 08210 from 10:00 a.m. to 10:45 a.m. The Funeral Mass will immediately follow at 11:00 a.m. Interment will be in the Cape May County Veterans Cemetery. Memorial donations may be made to Our Lady of the Angels Church at the above address. We were deeply saddened to hear the passing of Agnes. Sending our love and deepest sympathy to Jim and the rest of the Dugan family. My sincerest condolences to the Dugan family. Mrs. Dugan was such a nice neighbor who always had a smile on her face. May the wonderful legacy she left live on in the family she cherished so dearly. You are the heart of our Family and will be in our thoughts daily. I know you'll be watching over all of us and doing your best to keep us all on track. Love you and miss you Momma. Dear Jim it's been a long time since we last ment. I am so sorry to see that Agnes has gone to heaven. Stay strong my long past friend I greave for your lost and hope her memory will help you heal in this time of sorrow. God bless you and your family. To Joan and family: My sincere condolences and prayers to you all. Colleen, So very sorry for your loss. You and your family will be in our prayers.